Goldilocks was onto something. The dumpster you order needs to be ‘just right’, not too big, not too small, but ‘just right’. Selecting the appropriate dumpster size is an important factor when you order, maybe the most important. If you order a dumpster that’s too large, you waste money because you didn’t even come close to filling it up. You’re paying us for empty space. 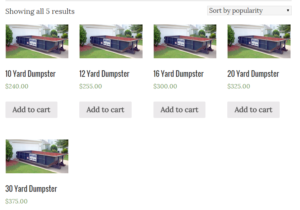 Example: A 30 yard dumpster costs $375 but, if you only fill it a third of the way, you just wasted $135 because a 10 yard dumpster costs only $240. Order too small and you may waste both time and money. Time is wasted because to finish the job you need to order another dumpster or you just have to load up the excess and take it directly to the disposal facility. Unless we are right around the corner (unlikely) with an empty dumpster waiting for your call, you may have to wait 12-24 hours for another one. If you have a crew on site to help load then you are paying for them as well. If you have to order a second dumpster, which is called a ‘swap out’, then you are looking at an additional, full priced dumpster. Example: Say you started with a 10 yard for $240 and had to swap it out because you underestimated the amount of junk you accumulated. That swap costs as much as the original $240 so now you are paying $480 for 20 yards of debris. If you had just ordered a 20 yard dumpster for $325 you’d be ahead of the game in money and time savings. We try to give you perspective when you’re ordering a dumpster, especially if you’ve never ordered one before. We give the dimensions but that doesn’t always tell you a lot. To give you perspective, a standard parking space at the mall is 20’ long by 9’ wide. Our 10, 12 and 16 yard dumpsters will fit inside that footprint very easily, with room to spare. In our experience, most homeowners performing a whole house clean out after several years of living in one home will get by with a 16 yard or under. We always advise customers to plan ahead and stockpile their items for disposal prior to ordering. That gives you the best perspective of all since most or all of your debris is visible in one location. You can even measure the length and width of that loosely gathered pile so you can order intelligently. Another wise move is to break down large items or items that take up a lot of air space. Don’t just throw empty boxes into the dumpster, break them down. Same thing with furniture. A chair with the legs still attached will take up a lot of air space so break off or quickly saw off the legs and chair back. Same strategy works for a table. Approach dumpster loading like you are packing to move the material. Space costs money in both moving and dumpster filling. Once you have followed these tips and feel ready to order your dumpster, we have made it even easier and more convenient by offering online dumpster ordering. Once you have placed your dumpster in your shopping cart, you can indicate where you want your dumpster delivered during checkout. If you aren’t ready to order your dumpster just yet, bookmark our online store, for quick and easy access later. Our goal is to help save you time and money when you are ready to clean out your home.